Finnfund has invested in four renewable energy projects in Honduras a total amount of USD 35 million: La Vegona (38.5 MW hydro), Los Laureles (4.8 MW hydro), Mezapa (9.4 MW hydro) and Valle (50 MW solar). The investments were made between 2010–2015. Finnfund exited La Vegona in 2017. In order to meet the increasing demand for electricity, and to reduce dependence on expensive and polluting thermal plants, the Honduran government encouraged private power producers to invest in renewable energy generation in the 2000s. As a result, the installed capacity increased more than 50% between 2009 and 2016 (to 2,450 MW) largely due to rise in renewable solar and wind power. Despite increase in renewable energy production, the generation mix in Honduras still depends on thermal energy, mostly diesel and fuel oil. State-owned hydropower is another important source of energy. Solar and wind power comprise 17% and 7% respectively of the total generated electricity. The study was commissioned to find out what might be the economic and employment impact of the power investments – how improvements in power availability and price affect development across economic sectors and actors. 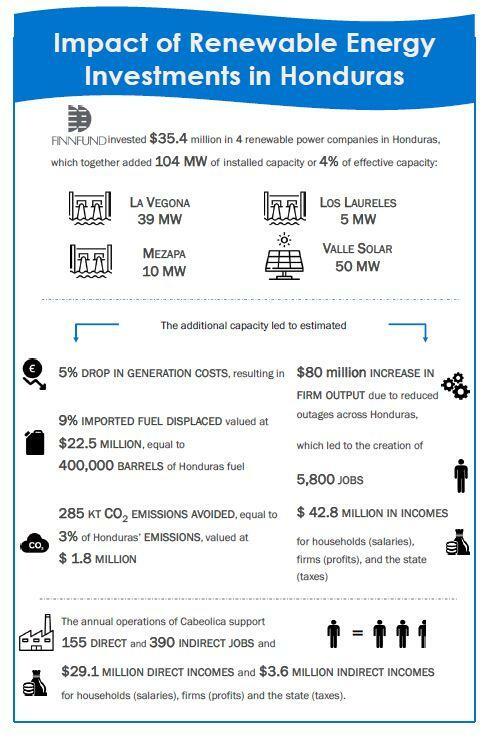 Finnfund’s investments added 4% to the total effective capacity of Honduras’ energy supply. By substituting thermal power with cheaper hydro and solar, Finnfund supported plants reduced the average cost of generation in Honduras by almost 5%. Displacement of fuel-run plants translates into 9% (or 400 000 barrels per year) reduction of imported fuel and 3% of Honduras’ carbon emissions. There is no data available on outages. It is, however, estimated that production time increased by 0.5% which translates into USD 43 million value added into economy and over 5 000 jobs. In addition, the plants’ operations support over 500 jobs bring value added of USD 30 million. The study was conducted in spring 2018 and followed a pretested methodology of how power availability and affordability affect economic output. This methodology consists of construction of an electricity price model, an analysis of outage data and estimation of the related economic output and employment increase using an input-output model and employment intensity data.